Springmoor welcomes Heather Cross, Read and Feed’s Volunteer Coordinator, to our Resident’s Association Meeting today. For those that heard her speak before you know that she is very inspiring and passionate about their outreach activities in Wake County. Last September, we traveled to the Cary offices to help assemble 600 tote bags to begin the year’s program. One group of Springmoor volunteers helped with the morning shift and another followed in the afternoon. Together, they began our first partnership with Read and Feed. Springmoor will participate this month with the collection and assembly of the children’s food bags. The bags will be filled with food for the children to eat during their spring break. Without a school breakfast and lunch program, many children in Wake County go without a meal during their day. We are asking for donations of food as well as financial support. Our teams will pack each bag with three meals for a day or bags with snacks for the seven-day vacation. Springmoor will provide the tote bag and the food for each bag. The collection bins have been filling up but we are still in need of a few specific items: pasta, pasta sauce, canned vegetables, canned tuna or chicken, dried beans and canned milk. The Convenience Store in our North Village lobby is an easy way to shop for your donations. The items most needed for the children’s bags are marked for easy shopping. You may also pick up items during your weekly grocery store run. Assembling the bags will take place at the end of our food drive, the last week of March. On April 3, we will take a bus trip to Fox Road Elementary School to deliver our Read and Feed donations. 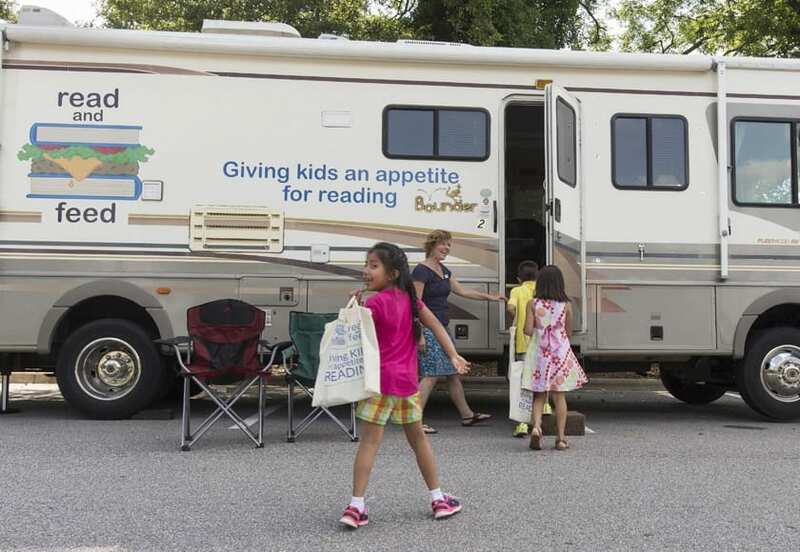 A second trip on April 4 is planned for the Homestead neighborhood’s Read and Feed site. Our Resident Life Department is asking for volunteers for all of these activities. We would love to have your help! The Read and Feed mission is “to give low-income children an appetite for reading by strengthening literacy skills and providing encouragement in a nurturing, neighborhood environment.” They hope to eliminate hunger, provide mentors to help children read and books to build home libraries. We can all be a part of this worthwhile mission by donating.